Chicken, spinach and pasta - from raw to cooked in only one pot! Does it sound too good to be true? Did I tell you there's also no cutting involved either? This delicious dish is ready from start to finish in 30 minutes or less! Making one-pot pasta is now super easy with the Instant Pot electric pressure cooker! Once you learn the trick to cook al dente pasta in the Instant Pot here, from hippressurecooking.com, you can make all sorts of delicious one-pot pastas! 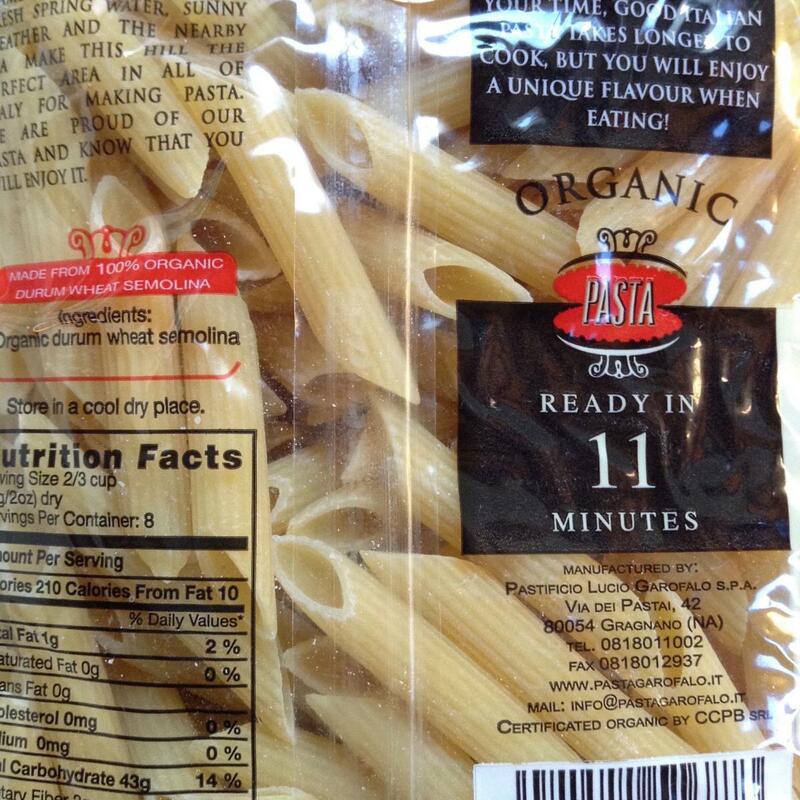 You look at the package of the pasta for the total time needed to normally cook the pasta. The pressure cooker will require half that amount of time! This bag of pasta cooks normally in 11 minutes, so I halved it and rounded up (6 minutes), then added a few minutes to 8 minutes, as I like this pasta a little softer than al dente. The ingredients I had on hand for this recipe were: a 1-lb bag of organic Penne pasta (Costco), a 1-lb bag of frozen organic spinach (Sprouts), a pack of fresh organic chicken drumsticks (5 count, Trader Joes) and a jar of organic Bertolli pasta sauce (Costco). I took the skin off the drumsticks and put them at the bottom of the instant pot (1). Then I poured the entire bag of pasta (2) and the entire jar of pasta sauce (3). I filled up the empty pasta sauce jar completely with water, then put the lid back on and gave it a good shake. All that water went into the pot as well. I made sure to add enough water so the pasta was all covered (4). Next, I poured the whole bag of frozen spinach onto the top (5). I didn't stir the spinach, as it will cook quickly and should be left at the top of all the ingredients. After I gave the rim of the inner pot a good wipe (*any sauce on the rim may cause the lid to not seal well! ), I put the lid on and pressed "Manual", then adjusted the cook time to 8 minutes (6)! The chicken was tender, and the pasta was flavorful. A quick and easy meal! Tip: To remove the skin from chicken drumsticks, take a paper towel to help you grip the loose end of the skin, then pull the skin towards the joint on the drumstick. 1) Place the 5 chicken drumsticks into the inner pot. 2) Add the entire package of dried pasta, then the whole jar of pasta sauce. 3) Fill the emptied pasta sauce jar with one jar full of water. Pour into pot. Make sure all the pasta is covered with liquid. If there is not enough liquid to cover the pasta, add enough water accordingly. 4) Add the entire bag of frozen spinach on top. Don't stir, as you want the spinach to be on the top as it will cook faster than the rest of the ingredients. 6) Lock on the lid. Make sure the steam release handle is on "Sealing". Press "Manual", then adjust the time to half of the time on the package of pasta (for al dente pasta) with the -/+ buttons. If you want it to be softer, add 2 minutes. For example, my package of pasta normally takes 11 minutes to cook, so half of that time (rounded up), is 6 minutes for al dente pasta. I added 2 more minutes to a total of 8 minutes as I like the pasta a little softer. 7) When the cooking time is up and the pot beeps, press the "Keep warm/cancel" button to stop the warming function. Immediately quick release the steam by flipping the steam release handle to "Venting". I like to put a kitchen towel over the vent before using a long kitchen utensil to flip the handle, in case any liquid spews out. 8) After the pressure float valve drops down, indicating the pressure in the pot has gone down to normal, twist open the lid. Be careful of any steam.